Weighty Matters: Is "Fourth Meal" contributing to rising obesity rates? Is "Fourth Meal" contributing to rising obesity rates? Never heard of "Fourth Meal"? 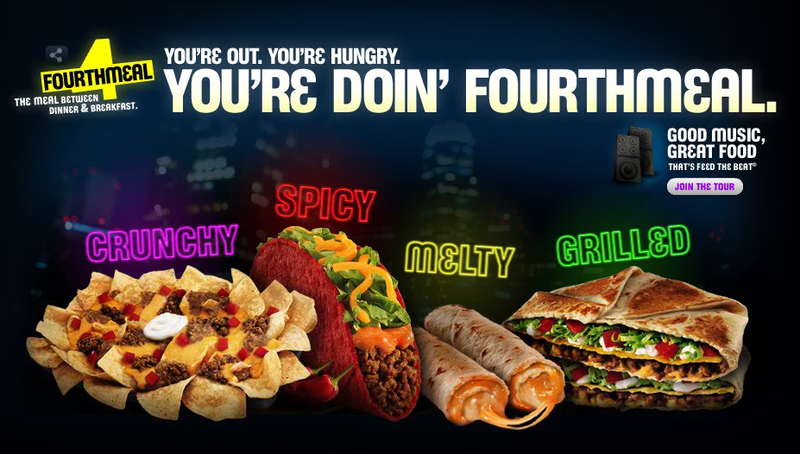 According to Taco Bell it's, "the meal between dinner and breakfast", and kidding aside, it makes me think. 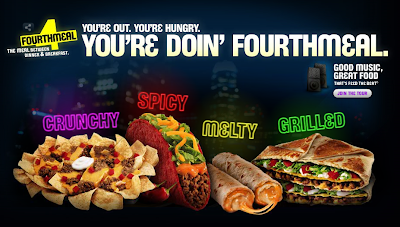 Certainly for College students out partying, Fourth Meal's pretty normal. I certainly had my share of Fourth Meals back in the day. I'm betting that Fourth Meal is far more common than most might think. Now it may not be a formalized meal, but I know that night eating is certainly a prevalent affair. And it may actually only be "Second Meal" as that person may well have skipped breakfast and lunch. I'm guessing there are a great many packs of cookies and whole bags of chips that make up home based Fourth Meals. My take on night eating is that more often than not it's a response to poorly organized daytime eating and that once a person's eating every 2-3 hours, with sufficient calories and protein, nighttime struggles (and Fourth Meals) tend to disappear. Don't believe me? It certainly can't hurt to try. Breakfast within 60 minutes of waking up. Meals with a minimum of 300 calories for women and 400 calories for men. Snacks with a minimum of 100 calories for women and 150 calories for men. 8 or more grams of protein with every meal and snack.